Born in Philadelphia, Rocky started playing drums at the early age of 10. By age 13 he was playing big band music from the 1940’s in his grandfather Chet DeLorenzo’s band. Rocky say’s “Everything that I know in music today I owe to my Grandfather. 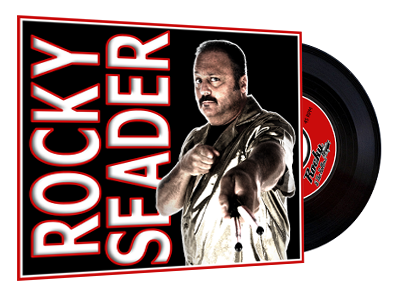 He was the BEST!” At age 16, Rocky started playing Rock & Roll with various bands in the Philadelphia-South Jersey club circuit. That is where he met DANNY & THE JUNIORS of “At The Hop” fame.” His powerful drumming impressed DANNY & THE JUNIORS and earned him a spot as their drummer and later becoming their musical director. Rocky spent 10 years on the road with DANNY & THE JUNIORS and learned most of what he knows today from that experience. “That was some of the BEST times of my life, Rocky says’. Joe Terry and Frank Maffie really showed me the ropes.” They remain long time friends and still work together on occasion. In the early 1980’s Rocky decided to start his own group. He was in such demand by promoters and acts in the business that he had to break away from DANNY & THE JUNIORS and go out on his own. That is where Rocky & The Rollers began. The early 1980’s also introduced Rocky to JON “BOWZER” BAUMAN of SHA NA NA fame, and the two have become life long friends. Rocky is the drummer and musical director for BOWZER’S ROCK & ROLL PARTY and the band tours with BOWZER nationally and internationally throughout the year. Because of his powerful and highly energetic drumming style Rocky has become one of the most sought after drummers in the business today. Rocky also runs a successful production company “ROCKY ENTERTAINMENT, Inc.” that produces shows all over the world.